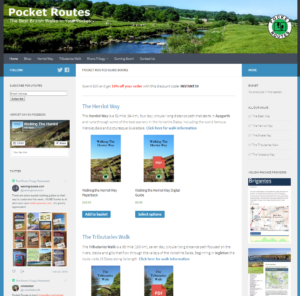 I had to find some lightweight boots to replace the Fastpackers – and I had to find them fast – there are only 5 weeks to go until I set out from Edale on the Pennine Way and I certainly don’t want to be doing that with untried footwear. 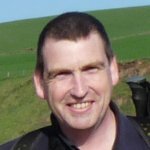 A friend has some other Salomon boots – the 4D Quest – and he absolutely swears by them – in a good way! They are very comfortable and completely dry. So I don’t really have a problem buying Salomon. I’m still wearing the Mission GTX boots, although the current ones are a replacement pair – supplied by Salomon when the first set started to deteriorate after 16 months. 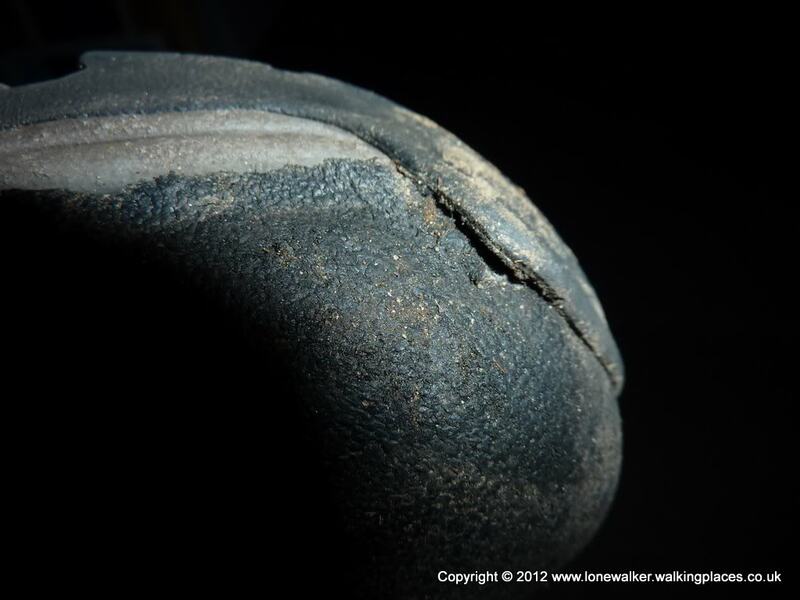 Fortunately the Salomon warranty period for boots is a very impressive two years. The original pair saw me through two summer of walking, one winter and two long distance paths in their time, until the toe box started to peel from the upper, letting in too much water for them to be comfortable any longer. The Missions are no longer available in shops, so I’ll be very disappointed when the current pair die on me. These have been my favourite boots of all the ones I’ve used to date. I’m beginning to despair of ever finding a pair of reliable, long-lasting, lightweight boots for the hills. The list of boots I’ve had in the last three or four years seems to be endless and none of them have been completely satisfactory for more than a few short months. Maybe I’m expecting too much, I don’t know, but at around £100 per pair I would hope to get more than a single year’s walking out of them. I thought I’d discovered the answer last year with the Salomon Mission GTX boots. After almost 12 months of use they were certainly lightweight, they were supremely comfortable and they seemed to be on the their way to ticking the final box too – longevity. It all went horribly wrong almost exactly 12 months after I had them though. Those faults are documented elsewhere on this site and involved the footbed of the shoe coming away from the upper and leaving longitudinal gaps along the boots that let in serious amounts of water. 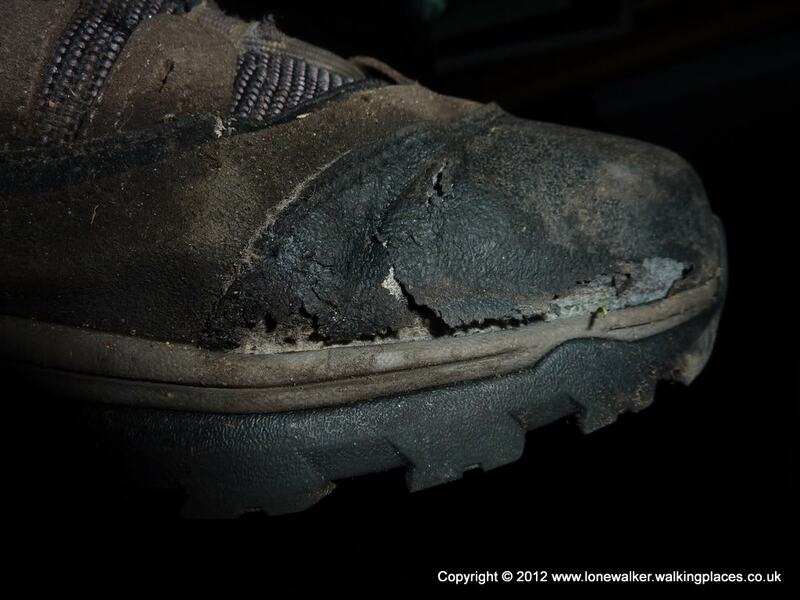 Fortunately, Salomon’s warranty policy is excellent – you get two years on boots – and Go Outdoors where I bought them from were very helpful in getting them replaced for free. The new boots were identical and I put the problems of the first pair down to a freak manufacturing problem and crossed my fingers. Just last week though, these new boots also started to go quickly downhill. After noticing that they were letting in more water than I would like, I started to notice that the coating on the front of the boots was fraying and peeling away from the upper. Over the course of a single walk I could see this process becoming increasing worse. I got home and took these photos – the left boot is the worse, but the right boot is showing signs of doing the same thing. So these boots had lasted even less time than the first pair – I’d got 7 months walking out of these. Again the Salomon warranty was called upon. Although they don’t re-start the warranty period when the replacement boots were provided, I was still within the 2 years period from the purchase of the original pair. I took them back to Go Outdoors again. I must say, for what appears to be an outdoor supermarket type organisation, Go Outdoors are fantastic. I ended up speaking to the same chap as last time and he remembered me and my boots – I suppose it helps that he has a pair of Missions too. He contacted Salomon immediately. As the boots are no longer made, Salomon weren’t able to replace them, so I’ve been given an in-store gift certificate for the original price of the boots. Now this isn’t anything like as flexible as a refund, but I suppose it’s an acceptable outcome given it’s been almost two years. I’m tempted to try another pair of Salomon boots – the Comet 3D GTX seem to be a replacement boot for the Missions, but they are £125 – which seems quite a lot for what they are. Thanks for the reply Stuart. Do you think they can be reliable for use in Alpine zones, on sharp rocky terrain? P.S. I’ve bought my pair in Italy and can give you an email and address of that shop if you want. Just let me know. 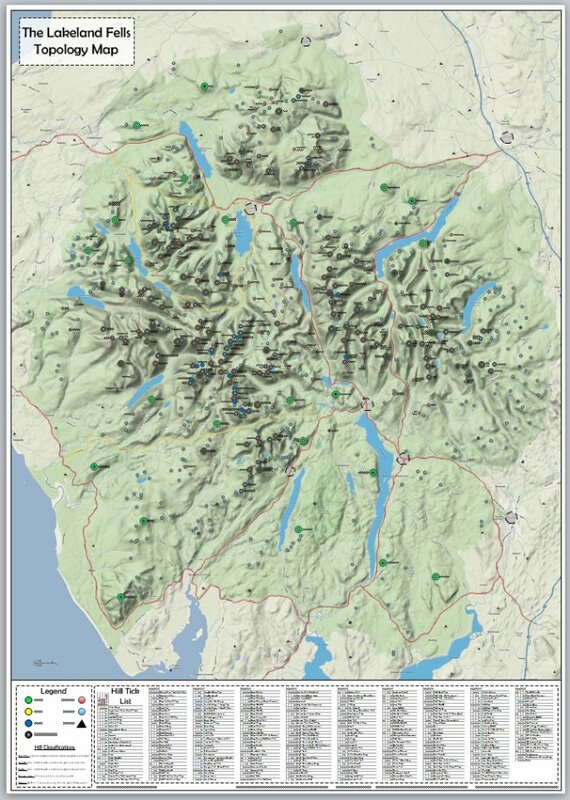 Alex, I’ve never walked in that sort of region, but I’ve used the Mission in every sort of terrain in the UK and it was always a good performer. Perhaps not the grippiest boot I’ve ever had, but would certainly be OK for rocky terrain I would think. I don’t have any budget really for new boots and there are still one or two suppliers with old stock in the UK if I ever do, but thanks for the offer. Much appreciated. Hi Stuart, Your review of Salomon Mission GTX is detailed and helpful. I’ve recently bought these boots too, but one thing which makes to worry about, are the holes on the sole, where plain plastic sole is visible from rubber one. Did you have any problems with that? Getting dirt or little stones inside, or something other. Wander why Salomon made the sole like that. Also, It’s written that they are made in Vietnam, what about yours? Alex, no didn’t have any problems with stones or grit getting in, the problems I had are documented and other than that they were great boots. I didn’t think Salomon were making them anymore, so interesting if you’ve bought them recently, I may try and find some too. These were the most comfortable boots I’ve ever had and I miss them dearly. Unfortunately don’t have them anymore, so can’t say where they were made – but a lot of gear manufacturers are using far east locations to make gear now, so I wouldn’t let that put you off. Hope you enjoy them as much as I did. 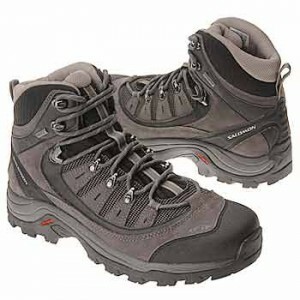 I bought a pair of these boots in Feb 2011 after reading your revue, £79.99 from Taunton Leisure. 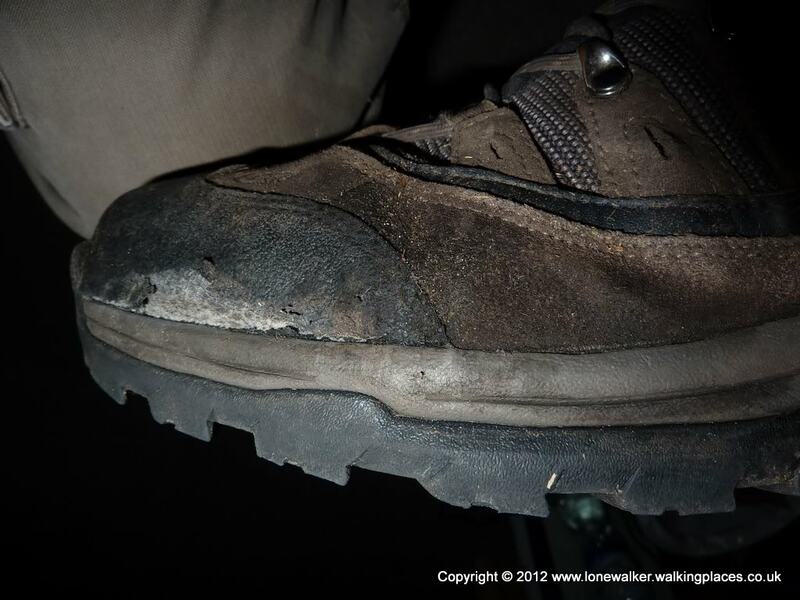 I wore them for a 12 day C2C in June 2011 and numerous other walks. They are still going OK and I am depending on using them for another C2C in June. I find them very comfortable but also have trouble with both second toes bruising and also the right big toe. I use gel fabric toe guards from 2 Foot 2 which are a big help.